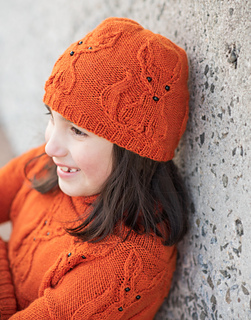 Playful foxes ring around the crown of this hat, making everyone who sees them happy. 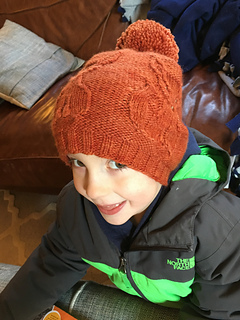 Worked in a DK or worsted weight yarn, the hat goes quickly despite the complexity of the designs. You’ll find you can’t wait to see those little faces appear or to see the look on the face of the recipient! PLEASE NOTE: PATTERN IS ONLY FOR THE HAT! 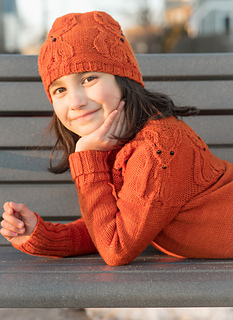 The sweater pattern is available in the Spring 2019 issue of Cast On Magazine, the on-line publication of The Knitting Guild of America. 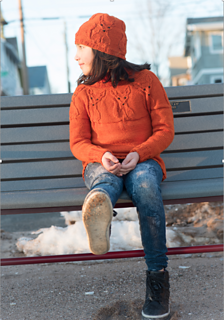 If you’d like to knit the sweater, join TKGA and gain access to all past issues! Once the rights return to me, I will publish the sweater as a free-standing pattern, but why not get all the benefits of TKGA and become a member. 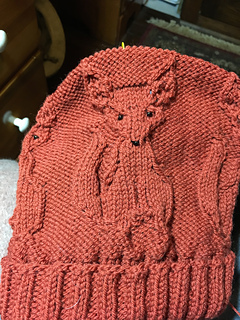 In addition to yarn and the usual notions, you will need 9 (12, 12) 1cm beads for the eyes and noses of your little foxes AND a crochet hook for adding the beads as you work. Note that crochet hook size is only a suggestion. Select a hook that will easily fit through the eye of your beads; alternatively, use the dental floss method for beading. The motif is provided as a chart only. 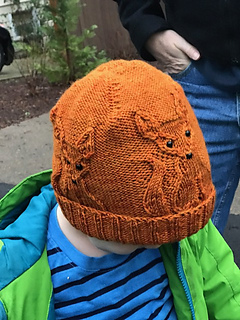 This hat is an extension of my Fox Happiness sweater design which appeared in Cast On Magazine, Spring 2019. The motif was inspired by Shayla Morrigan’s Vixen Socks, redesigned to add the body and make the fox into a fox pup.